A little ink work in the new sketchbook. I’m trying to take the suggestion from an article I read in a recent issue of Artist’s Magazine. Without looking up the quote, the artist interviewed essentially said to stop looking for inspiration in other people’s artwork, but instead create your own. How many wasted minutes have we scrolled through Pinterest looking for inspiration, only to lose sight of the real goal of seeking inspiration? She feels that when we go searching like this, we are really seeking for artwork to copy, rather than create something original. She also said to use a variety of materials and experiment with them; stop placing so much pressure on yourself to create a perfect piece every time… Or at all. What better advice? Don’t we place too much pressure to make everything perfect, especially the first go around, because we are all so short on time. 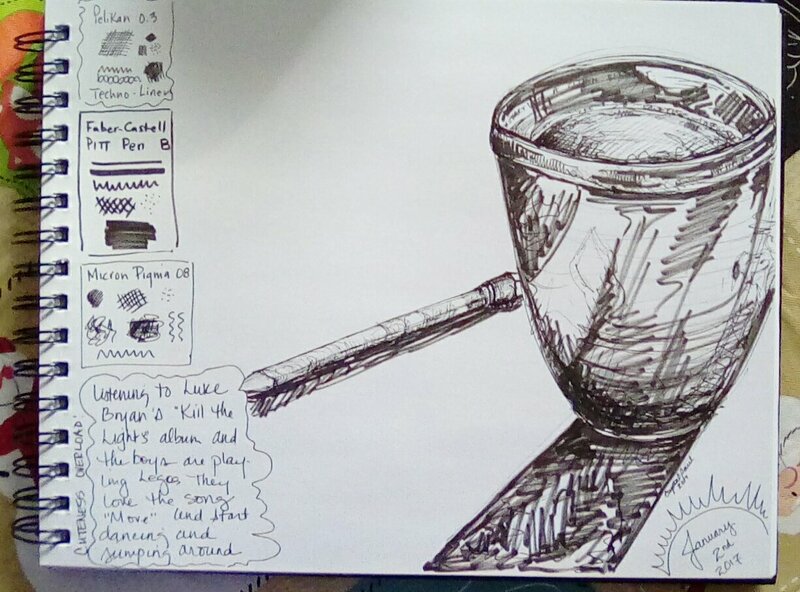 In this sketch I drew my morning coffee cup, and I didn’t care that you could see all the lines I used to get the curves accurate. I also used several ink options, and made notes to the left to remember which pens I used. I placed a little anecdote in the corner about my dsncing boys, who were engrossed in their Lego playing, which allowed me time to focus on my art (I didn’t even mind the few interruptions from the boys asking me to pry those tiny Lego pieces from their counterparts). Ahhh another peaceful Monday morning. Let there be many more this year! P.S. I would like to fill the rest of the “white space” in, and may do so later in the day.